Underwater photography is one of the most popular activities within diving. We live in an increasingly photographic society, where selfies have become proof you were there and selfie sticks the new hazards on the tourist trails. As divers, we get to experience often exceptional events, like snorkelling with whale sharks or exploring a world famous shipwreck such as the Thistlegorm. It is only natural we want to record our dives to adventure. Unlike other activities within recreational diving, such as deep, dry-suit and cavern diving or using nitrox, underwater photography looks to be something you can easily get into without any special training and certainly no certification card. Just buy an underwater camera package off the net, put it on auto or underwater mode and you are set for success from your very next dive trip. Unfortunately, if you take this approach, results are actually often bitterly disappointing. There are many reasons that divers new to underwater photography get such poor pictures. Much of the blame falls on the way in which the diving industry has marketed underwater photography equipment and tuition. Before we get into these issues and how to overcome them to take great underwater pictures, even as a beginner, let’s have a quick history lesson to put things into context. Right from the beginning of the 1950’s as recreational scuba diving began to grow, divers wanted to take pictures. The equipment was obviously film based, and it was expensive and difficult to use. The diver training programs that were evolving involved many more dives than modern courses and that tended to mean only very experienced divers progressed to taking underwater pictures. In the early years, books and articles on taking underwater photographs were often written by people who themselves had only a couple of years’ experience of underwater picture taking behind them. 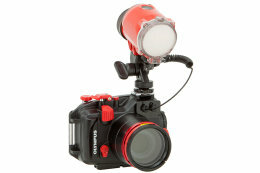 Even the most basic underwater camera cost at least as much as a scuba tank, BCD or regulator. And, except in very clear water, they took mostly dreadful pictures. 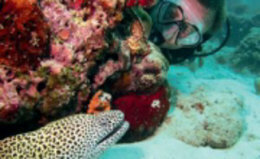 This was because budget cameras were typically holiday compacts in housings and had fixed lenses that could neither take decent close ups or wide-angles, so they were hopeless for photographing small subjects like individual reef fish and nudibranchs or large subjects like divers and wrecks. In fact, the built- in lenses only really worked for head and shoulders shots of your buddy or shoals of largish fish. The lenses had to be focused accurately by guess and this distance set on a scale, assuming the housing even had a focus control. Many did not, forcing the photographer to work at only one specific distance, which can be quite a task when working with moving fish! An underwater camera system that was versatile enough to capture good underwater pictures of a wide range of subjects could cost as much as a car and required considerable theoretical knowledge and practical experience of surface photography to use effectively. For decades a diver with even a basic underwater camera was unusual and a serious underwater photographer an exceptional sight. Famed National Geographic Magazine underwater photographer David Doubilet berated this 1960’s housing for the legendary and very expensive Leica film camera. The housing had only three controls – shutter release, wind on and a dial that could be assigned to focus or adjust the F stop, but not both. This forced him to either work for the whole dive at one distance or hope that the light did not change! Composition was by an intrinsically inaccurate frame finder, flash bulbs had to be changed after each shot and the maximum film load permitted just 36 pictures to be taken. Today’s compact digital underwater cameras permit a virtually unlimited number of pictures to be taken on a single dive, instant review underwater and lots of photo editing options. In the late 1990’s underwater camera equipment began a change that would become seismic. Digital compact cameras that could be housed affordably came onto the market. Digital provided three outstanding benefits over film. An almost unlimited number of pictures could be shot on a single dive, instant playback let you see what you’d just photographed and digital offered lots of creative photo editing opportunities for improving images after they were taken. Until digital arrived, photographers using film cameras were usually limited to a maximum of 36 frames. Some photographers carried two or even three cameras on a single dive to increase this. To some extent, underwater photography is a numbers game. One of the similarities between professional underwater photographers and high achieving enthusiasts is how much time they will devote to a single subject and how many images they will take of it. For today’s digital underwater photographer, the limits to how many pictures they can take is more often set by cold, gas and decompression considerations than by the camera. Whereas a film user could not check their results until the film could be processed to confirm they had no equipment faults and that their techniques and compositions were working, the modern photographer has immediate feedback. This second advantage means a new underwater photographers learning curve can be much faster at they can see their results underwater in real time. This means they can make adjustments to settings and composition more or less instantly. For an underwater photography instructor the instant playback means they can review a student’s pictures underwater as they take them and provide immediate advice or even shoot a demonstration image and pass it around the class. The third benefit is the ability to edit images on a computer with relative ease to enhance what was taken ‘in camera’. In the past film users often had to pay very high rates to a specialist printer to improve their images for competition for example, but even the best darkroom wizard would be severely limited in what they could enhance given the limitations of a film negative itself. Digital photo editing is accessible to all and can be used to salvage digital images that could not be recovered if shot on film, such as a blue whale in poor visibility, for improving composition, removing stray fin tips or for colour correction to remove strong green or blue colour casts. Underwater digital compact cameras were also comparatively inexpensive and much more versatile than budget underwater film cameras of the late 90’s. And the price kept falling as each new camera entered the market, even as the specification went up. This made them affordable for more divers and the results were certainly far better than most divers were achieving with entry-level film cameras, encouraging people to persist. Diving had also changed dramatically. Diver training had become more packaged and much faster to complete in the late 1980’s, enticing many more people to join the sport. However they were often less committed than previous generations. Diving was no longer a lifestyle choice that took up all their time and cash, but an occasional activity to be enjoyed alongside other pastimes, such as skiing or mountain biking. They trained faster to a more basic level than had been usual in UK, and dived less frequently, often only on occasional overseas holiday trips. 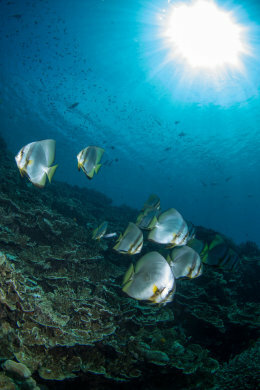 The combination of more accessible overseas diving and more affordable underwater cameras has created a healthy market for underwater photography equipment which is being met by an increasing number of manufacturers. 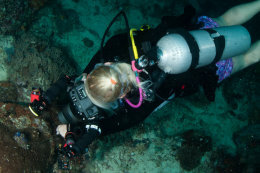 What has not kept pace with a surfeit of equipment – good, bad and indifferent - is the training to help divers master the equipment and techniques of successful underwater picture taking. We’ll explain the reasons for this and INON UK’s solutions a little later on. Underwater photography events are a great place to meet INON UK instructors and trade ideas and experiences with other underwater photography enthusiasts. Here Lisa runs a coaching session organized by INON UK instructors Nick and Caroline Robertson –Brown of Frogfish Photography. Keen underwater photographers often take courses or workshops with several instructors to broaden their range. Many INON UK instructors, including Nick and Caroline, regularly shoot for magazines and have authored dive and underwater photography books. Learning from a seasoned photo pro is a good investment in your own success as an underwater photographer. Another frustration for us, as experienced underwater photographers, underwater photography instructors and equipment distributors and retailers is how underwater camera kit is marketed. The impression that is often given by underwater equipment manufacturers is that the equipment will take great pictures for you, automatically. It can’t and won’t. Often, the equipment being pushed at divers who are starting out in underwater photography isn’t really adequate – this is especially true of video lights and strobe arms, for example. Most video lights are too weak to be used for lighting stills pictures and many arms so short they will cause backscatter except at very short distances. The fact is, there’s an information vacuum that means consumers are often misled, however unintentionally, into buying equipment that falls short of what’s needed to take pleasing underwater photographs. INON UK has provided two-day product training programs to our official INON UK dealers to help ensure INON UK customers receive the proper equipment advice. Unfortunately, the popularity of INON equipment has led to some grey and parallel importing within the UK and INON UK is unable to support equipment sourced through these unauthorized outlets. The staff at these outlets are not INON UK product trained and the equipment is not guaranteed by either INON UK or INON Japan. A benefit of a good underwater photography course is that you should leave it with a much better understanding of the role equipment plays in taking successful underwater images and gain a valuable insight into its strengths and weaknesses. Ideally, you’ll get to try underwater photography equipment yourself that your instructor provides. We offer our own students complete sets of loan camera equipment for INON UK Level One Underwater Photography Courses, as do many INON UK instructors. The reason we do this is that for students to fully benefit from the program they need to use close up and wide-angle lenses and underwater strobes with decent strobe arms, as well as a camera that provides full manual exposure control. Many divers only take an INON UK Underwater Photography Course when they’ve done several trips and are still getting disappointing results. By this time they’ve already purchased expensive equipment and, sadly, the course often shows up insurmountable shortcomings in the kit they have chosen or been recommended. Successful underwater photography is extremely equipment dependent. If you don’t have the right kit, none of the techniques we can show you will overcome those limitations. Ideally, divers would take a thorough underwater photography course before buying underwater camera equipment, ensuring they had the knowledge to make an investment, not just a purchase. Why take snapshots when you can make pictures? Many divers visit great locations with fantastic subjects and have superb underwater camera equipment. But they return with dull images. The INON UK Level One Underwater Photography Course includes a revealing advice session on simple composition rules that professionals rely on to make underwater photographs with real impact. Few of the UK’s best respected underwater photography coaches teach standard scuba training agency underwater photography courses. Instead they teach according to their own syllabus. Why do the experts take this approach? The answer lies in a fundamental difference between regular diving specialties and underwater photography. Almost all scuba specialties are geared around developing diving knowledge, skills and experience. Underwater photography is different. It is not a diving specialty, but a photographic one. Diving is only your means of transport to your photographic location. This difference presents a number of hurdles for scuba instructors and training agencies wanting to offer digital underwater photography courses. Professional scuba instructors can usually self-certify as specialty instructors. As a former professional BSAC, PADI and NAUI diving instructor, Steve did this. Each specialty only required him to show he had logged a maximum of 20 dives doing that activity himself. Dry suit, night, deep and wreck were some specialties that Steve was self-taught in and felt comfortable enough to teach. But he never applied to teach underwater photography. Despite a background in land photography, being coached in underwater photography by Martin Edge, and having provided images for books and magazines, he did not feel an experienced enough underwater photographer to teach it. Lisa spent many years taking underwater photographs and had earned a place as one of Diver Magazines most published photojournalists before she felt confident enough to teach underwater photography. Underwater photography is simply so challenging that twenty dives with an underwater camera doesn’t even begin to make you a beginner, let alone an instructor. Inexpensive compact digital underwater cameras now produce images of high enough quality to be used by magazines, such as this shot by Lisa Collins for Diver Magazine. For jobbing scuba instructors, learning underwater photography is also often far from easy. Many instructors get very little time to dive for themselves. They lack the opportunity to put the hours in under the water with a camera to master the basics, let alone learn advanced skills. For many full time instructors, surviving in a badly paid industry, the cost of an underwater camera system is simply unaffordable. Unsurprisingly, then, most of the people who are renowned for teaching underwater photography are from outside the industry, with just a few notable exceptions. 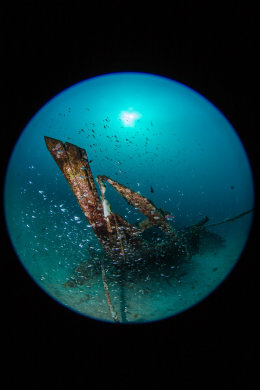 Dive centres and liveaboards also rarely invest in the underwater camera equipment needed for a student to learn underwater photography properly. Training agencies trying to capitalize on the interest in underwater photography have come up with courses that can be taught by an instructor with the minimum of underwater photography knowledge and experience and using an extremely basic camera outfit. But this approach greatly restricts what the student can learn to improve their own underwater photography. This is a great shame, because a beginner with a compact underwater camera can be quickly taught to take excellent underwater photographs that are every bit as stunning as those taken for diving magazines by a pro with a professional system. Indeed we have both illustrated magazine features with images taken with low cost compact underwater cameras. It’s just a case of knowing how. 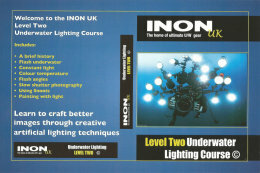 INON UK has taken a very different approach to underwater photography training. The original INON UK program was developed to overcome many of the problems associated with scuba training agency underwater photography courses. The course was created before INON UK was formed when Steve owned the underwater photography retailers and original UK INON importer Ocean Optics. It was co-designed by Steve and Ocean Optics then manager, Mark Koekemoer, who now owns the specialist retailer and official INON UK dealer The Underwater Camera Company. At the time, Optics had the option to offer any or all of three off the shelf regular scuba training agency underwater photography courses. The reason Optics did not was because Mark and Steve simply did not believe scuba agency courses provided the core knowledge, skills and experience needed to take consistently pleasing underwater photographs in clear water using a compact camera. Starting from scratch, they designed the course to include the essentials to help diver with cameras meet this modest ambition. Although Mark and Steve were both highly experienced with using compact cameras underwater, as well as professional level SLR’s, they felt they needed to do much more work with compact cameras to develop the course properly. The reasons they did so underlines the role hard won experience plays in successfully teaching underwater photography to others. Since their personal underwater photography was done with the goal of taking the best pictures they could, they had found ways to work with their cameras that yielded predictable results. Like many experienced underwater photographers, once they had a method of working, Mark and Steve rarely deviated from these settings. When on an expensive underwater photography safari, many underwater photographers prefer to shoot using tried and tested methods, rather than experimenting, because by experimenting with new camera settings you run the very real risk of ruining an unrepeatable shot. Another reason was that, for certain subjects, Mark and Steve would normally choose to use their SLR’s. Small reef fish are a good example, because their diminutive size and skittish movements challenge compact cameras built in lenses and autofocus capabilities. The divers the course was being developed for were expected to own compact cameras and would not have this option. So it was decided that the only way to create an underwater photography course that met these diver’s needs was to test compact cameras on difficult subjects like these and find ways to get around the compact cameras limitations. This also raises another problem that some top underwater photography instructor’s face – they don’t use compact cameras much themselves. Many of the instructors who teach underwater photography honed their skills shooting for publication. Although digital underwater compact cameras have been popular since the early 2000’s, it is only very recently that magazines have accepted images shot with compact underwater cameras for major features. This has tended to restrict the pro’s to having to use underwater SLR systems or, in the last few years, compact system cameras, which have much more in common with SLR’s than they do with compacts. This has left some of the underwater photography coaches unfamiliar with underwater compact cameras foibles and makes it harder for them to teach compact courses. 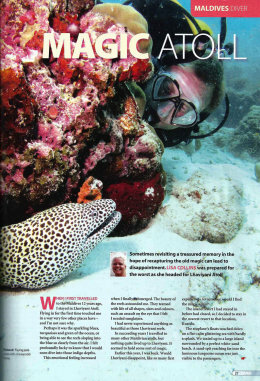 In fact, Mark was selected to write the year long Photocall series for Diver Magazine precisely because he had such extensive experience of shooting with both SLR and compact cameras. To master successful underwater photography techniques, you need to learn basic camera settings and understand the use of lenses and strobes. INON UK provides each student with a high end Olympus Stylus camera that includes manual exposure control, crucial to taking good pictures. Students also get to use INON UCL close up lenses, UWL-H100 wide-angle lenses with Dome Lens Units and INON strobes. Mark and Steve first had to select a location that would provide the subjects and conditions to build the background knowledge they felt was essential and produce illustrative pictures for the course. Professional underwater filmmaker Andrew Sutton’s ECO 2 marine research centre in Mikindani, just north of Mtwara in Southern Tanzania was chosen for the intensive seventeen day shoot. Demanding scenarios were thought up and exhaustive shot lists storyboarded that were designed to test theories and produce the desired learning curve. From the outset Mark and Steve knew developing the course would be frustrating. They would have to discipline themselves to ignore fantastic photo opportunities in order to concentrate on completing the tasks they’d set themselves. They only took compact cameras with them - the professional SLR’s stayed in the office. Mark Koekemoer, right, with Andrew Sutton on location in Tanzania. Tanzania provided the backdrop for developing the INON UK Level One Underwater Photography Course. Mark owns The Underwater Camera Company and co-designed the INON UK Level One Underwater Photography Course. Andrew Sutton is a professional underwater photographer and film maker, specialising in whales. He has filmed for the BBC, and is a fan of INON strobes. Some of the dives were designed to provide comparative tests. For example, restoring colour using natural light. For these dives, one camera would be fitted with a Magic Filter. Another would not. At different depths pictures were taken of a diver. The diver’s flesh tones and carefully selected equipment livery served as a colour test chart. One camera would be used to take photographs using auto white balance, custom white balance, underwater white balance and a final image with flash on auto white balance. The camera with the Magic Filter would be used to take the same subject on auto white balance and custom white balance. Later, when analysed, guidelines could be created that took into account the effect of depth and distance to subject on colour saturation and absorption. Students could then be given recommendations during the course on how to best get colourful pictures under different shooting conditions. Another example was working with strobe positioning to help course students understand the causes and effects of backscatter and provide simple guidelines for reducing or eliminating backscatter and evenly lighting fisheye photographs with just a single strobe. Other tests involved learning and overcoming the quirks of compact cameras autofocusing systems, which work differently to SLR’s, at the short distances typically used for photographing reef fish and with close up lenses used for critter photography. From these and other results a set of practical exercises were developed for students to complete underwater that would help them understand why their underwater pictures were not coming out as expected. It was felt that students could better understand the solutions that the course offered if they first fully understood the problems. It was these solutions that were then taught to the students. A series of six lectures were compiled that provided each student with must have information to back up and reinforce what was being learned in the water. Once the course had been knocked into a basic outline, Mark and Steve began to feel they had something significant. They approached Takuya Ttori at INON Japan and asked if he would peer review the course outline and discuss the program with Mr Inoue, founder of INON, and consider approving it. To their surprise and delight, INON agreed. INON’s public endorsement for the course was a pivotal moment. It is the first underwater photography course to be approved by and carry the name of a leading manufacturer of underwater photographic equipment. The INON name is hugely respected worldwide and INON’s decision to allow their brand name to be associated with an independently produced underwater photography course was a milestone moment. Early test courses received outstanding praise from students. Unexpectedly, Level One students included divers who had already taken other entry-level programs and, even more surprisingly, some who were actually qualified to teach scuba training agency digital underwater photography courses. Based on student’s comments, the description of the course was changed from a beginner’s underwater photography course to a beginners and intermediate program. The student’s feedback also underlined how essential background knowledge and experience was. Mark had faced the enormous challenge of distilling a mountain of information down to a course that struck a fine balance between providing all of the information the student would really need and not overloading the student with too much detail. Over the first eighteen months, Mark and Steve taught the INON UK Level One Underwater Photography Course to over a hundred divers and more than twenty instructors who wanted to teach the INON UK program themselves (since then, with the formation of INON UK, our instructor base has expanded considerably with Lisa and Steve running INON UK instructor training for an increasing number of overseas dive centres who want to offer INON UK underwater photography programs). On each course, students would raise points that they wanted to discuss. In this situation, experience counts. During an INON UK Level One Underwater Photography Course, the instructors are not supposed to be teaching at the limits of their own knowledge. This is important because many of the questions students often have are really beyond the scope of the INON UK Level One Underwater Photography Course, which is, after all, aimed at beginner to intermediate underwater photography students. However, an INON UK underwater photography instructor will usually be able to answer leading questions that relate to advanced techniques. We say usually, because some questions can still require even INON UK instructors to consult to come up with an answer. This underscores two points. Firstly, underwater photography is complex. All INON UK’s recommended books, several written by INON UK instructors or with Mark and Steve’s input, on how to take better underwater pictures exceed the length of most entry-level diving manuals. Secondly, this complexity means that no one can know everything and INON UK provides an infrastructure through its INON UK Advisory Panel that enables any INON UK underwater photography instructor to seek advice on behalf of a student if they need to. Receiving INON Japan’s endorsement to brand our underwater photography courses with their name was hugely prestigious. INON has a fantastic reputation worldwide that they need to maintain and protect. 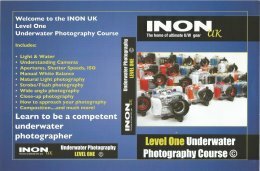 The INON UK Level One Underwater Photography Course is the first in the world to bear the title of a leading underwater photography equipment manufacturer. Identifying a good underwater photography instructor begins by studying their portfolio. It should go without saying that if they don’t take the kind of underwater photographs you aspire to take, move on. Lisa has her own image gallery plus all her photo stories and assignments archived on-line, enabling you to see the best of her personal underwater photography as well as those shot to order for the many publications she works with. Pictures that please you and those that please an editor are often very different. A publication may stipulate certain images they require to lead a photo story. For instance, they may want pictures of divers posed over an anemone to include eye contact for human interest and colour for impact. They might not accept a black and white image, however strong it is, because it will look isolated and out of place in a magazine otherwise full of colour pictures. Another reason they might reject an image is how it might look next to an advertising picture on the same page – you might have a stunning seahorse image, but an advertiser is also using a seahorse picture and using two next to each other conflicts. If you are taking photographs for yourself, you might choose not to include divers at all or want to be creative and take abstracts. Because underwater photographers have so many subjects to choose from, a range of equipment and techniques is called for. Shortlisting an underwater photography instructor means looking at how versatile an underwater image maker they really are themselves. Do they have a competent selection of close up, fish, diver and wreck pictures, for example, or are there gaps in their range of subjects and abilities? They should be happy to show you their work if they want your business. Another question to ask is about the scope of their underwater photography course. Even if the instructor you are thinking of booking a course with shoots the kind of images you aspire to does their course structure actually include the techniques you want to learn? Any accomplished self –taught underwater photographer will tell you mastering the craft is not easy. Nor is it quick. So you have to begin by nailing the basics first. For instance, the INON UK Level One Underwater Photography Course teaches students how to use a single strobe to create an evenly lit and backscatter free photograph. This is an important first step in learning to light underwater images satisfactorily. However many of Lisa’s own images for publication are taken using dual strobes. Dual strobe use is not normally taught during an INON UK Level One Underwater Photography Course. It is outside the scope of the Level One Underwater Photography Course, which is not an advanced lighting course. The INON UK Level Two Lighting Course does teach dual strobe and many other advanced lighting skills but assumes you already have a handle on single strobe use. So it is essential to confirm what will be covered on the underwater photography course you are thinking of booking. In many cases, once you progress beyond entry-level underwater photography, you may find you benefit more from one to one coaching than from off the shelf courses. One to one courses enable you to learn and refine specific techniques to suit your preferences and opportunities. 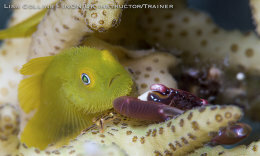 For example, close up photography before heading off to a critter destination like Lembeh. Because the instructor’s attention is not divided between a group, your own learning curve is much faster and you are free to explore off menu topics as they occur to you. Finally, very few of us get to do nearly as much underwater photography as we’d like. Interestingly, many divers who enjoy underwater photography rarely take pictures on land. It can be a really effective idea before an upcoming trip to take an underwater photography refresher class. This often does two important things. Firstly, it confirms you have all your underwater camera equipment and that it all still works. You might be surprised how many panic calls we get as someone suddenly realizes they can’t lay their hands on a vital item of kit or that a piece of equipment has seized or been damaged by leaking batteries. 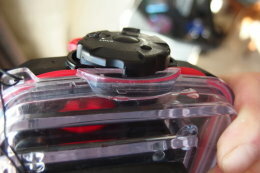 Secondly, it provides an opportunity to review camera settings and shooting techniques, both of which can easily be forgotten if you are not taking pictures underwater regularly. Any INON UK underwater photography instructor can provide this service. Flooding is expensive, can devastate your trip and is a very common occurrence. The INON UK Level One Underwater Photography Course shows you how to prepare and test your system in order to prevent damage to your expensive underwater camera equipment. It is going to be a long time, if ever, before underwater photography equipment sales and underwater photography training is properly supported by the diving industry. We hope some of the information we’ve provided helps you make informed choices that increase your personal success as an underwater image maker. Motion blur. Not all blurred images are out of focus pictures. Many are caused by using slow shutter speeds. This is a common problem when cameras are set to auto, program or underwater mode. The INON UK Level One Digital Underwater Photography Course explains how to easily prevent motion blur. Out of focus fish pictures. Compact cameras have a choice of autofocus modes and choosing the right one is essential to avoiding out of focus fish portraits. Different focus modes suit different situations and the INON UK course helps you understand which mode is your best option. Backscatter is a result of poor strobe aiming. Many packaged strobe arms make it almost impossible to avoid backscatter except when taking close up pictures. The INON UK Underwater Photography Course explains the causes of backscatter and teaches correct strobe positioning to prevent or minimize its effects. Controlling exposure is vital to creating pleasing images without distracting burned out sunballs or overexposed faces. The INON UK Level One Underwater Photography Course teaches you how to control sunlight and strobe exposure using manual settings. Flooding is expensive, can devastate your trip and is a very common occurrence. The INON UK Underwater Photography Course shows you how to properly prepare and test your underwater camera system before diving.